As you start your journey from Kochi in a taxi, up the hills towards Munnar, the snake road makes you feel dizzy and you want your journey to get over as fast as possible. But as you go round and round and climb towards the hill station which is situated at a height of 6000 ft and at a distance of 140 kms from Kochi, you realise that this hill station in Kerala is tremendously gifted and not for nothing that it adds to the tranquil beauty of nature in the state. The weather suddenly turns cooler, the fogs are travelling over the mountains and the first signs of women plucking tea from the green tea gardens, is an indication that you have arrived in Munnar. There are some beautiful resorts situated in Munnar and Siena Village. Located in one on of the hills overlooking the valley and surrounded by huge mountains, this becomes an ideal place to just sit back and marvel at nature's beauty. In the monsoon, the weather is so cold and windy that you could easily be blown away by the winds. It's also very cold and you need a sweater or jacket to keep you warm especially in the early mornings and late evenings when it rains. There is no special sightseeing at this hill station but once you reach there, you feel you just want to enjoy the flora and fauna than indulge in any sight-seeing here. However, if one wants to trek and enjoy watching animals in the wild, then the Eravikulam National Park, 15 km from Munnar is worth a trip. At a height of 2695 metres, the bus takes you there and then you take a trek if you want to go higher up and spot animals. 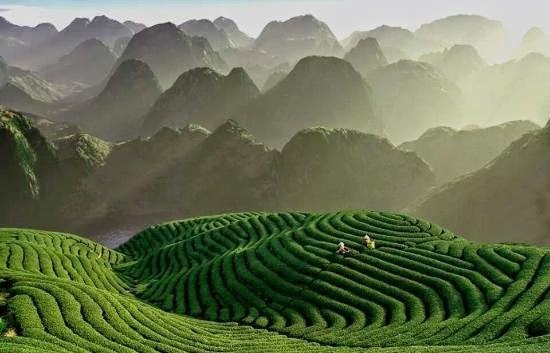 It's a fantastic view as you look below, the tea gardens. A warm cup of coffee and masala cashew nuts make you indulge in a heavenly experience as you enjoy the rains and the cool weather. If you feel that since it is Kerala, you will find good fish then you will be in for a surprise. Since it's a hill station, you don't get to eat fish here, but it is a treat to find nutmeg, pepper, cinnamon and such other spices' trees here in addition to the tea gardens. The markets here are known for their bakery items like unni appams and homemade chocolates. A visit to the spices garden or flower garden makes you realise how gifted the hill station is. Do not forget to indulge in some spice shopping.